Diethylene Glycol (DEG) poisoning have occurred world wide in past due to consumption of pharmaceutical manufactured with gycerin contaminated or containing high level Diethylene Glycol (DEG) .Between 1990 and 1998, incidents of Diethylene Glycol (DEG) poisoning occurred in Argentina, Bangladesh, India, and Nigeria and resulted in the deaths of hundreds of children, .In October 2006, an outbreak of DEG poisoning occurred in Panama, resulting in multiple cases of illness and death. Port-au-Prince, Haiti, with sudden kidney failure, resulting in at least 80 fatalities. An investigation by Haitian health officials, the Centers for Disease Control (CDC), and FDA discovered that the cause was DEG-contaminated glycerin in acetaminophen syrup manufactured in Haiti. In 1937, an outbreak of DEG poisoning occurred in the United States, which resulted from people ingesting elixir of sulfanilamide that contained DEG as a solvent. A total of 107 people died, many of them childrens. Diethylene Glycol (DEG) it show a type of cummulative or accumulative effect where it is metabolised to 2-hydroxyethoxyacetic acid (HEAA) and both Diethylene Glycol (DEG) hydroxyethoxyacetic acid (HEAA) are poorly eliminated though kideney and subsicuently result in to renal failuer . 2) 1-4 Dioxan :It is most toxic molecule , very dificult to metabolise and do not get degraded easily , it is found that it remains for years intact in soil where it is desposed , and the vegitables grown on contaminated soil are found to contain 1-4 Dioxan. 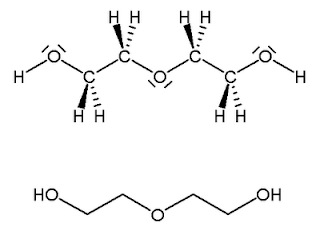 diethylene glycol (DEG) is used in the organic synthesis of 1-4 Dioxan. Looking at these facts many peoples still belive that pharmaceutical preparations contaminated with diethylene glycol (DEG) gets converted in to ethylene glycole known as antifreeze which is known as very toxic molecule. We have provided molecular structures of above three molecules down here . • The pharmaceutical manufacturers of the syrups that contained contaminated glycerin did not perform full identity testing on the glycerin raw material, including tests to quantify the amount of DEG present and to verify the purity of the glycerin received. • The pharmaceutical manufacturers of the syrups containing contaminated glycerin relied on the certificate of analysis (COA) provided by the supplier. • The origin of the glycerin was not easily apparent from the COA. The COA obtained by the pharmaceutical manufacturers of the syrups was often a copy of a COA on the letterhead of the distributor and not the COA provided by the manufacturer of the glycerin. The chain of custody or distribution history of the glycerin was also not readily known because the glycerin may have been sold several times between its manufacture and its use in medicinal syrup or other drug product. As a result of these practices, DEG-contaminated glycerin entered the pharmaceutical raw material supply chain. To avoid the use of DEG-contaminated glycerin, certain analytical testing procedures must be performed on all lots of glycerin (21 CFR 211.84(d)(1)). It is critical that all manufacturers and others using glycerin to manufacture or prepare drug products be aware of the importance of properly testing glycerin to detect DEG contamination. the identity tests, including the limit test for DEG, which appear in the USP monograph for glycerin. Alternatively, a manufacturer may use an equivalent identification procedure that includes a test to detect and quantify DEG provided it meets the relevant safety limit. One alternative procedure is a thin-layer chromatography (TLC) method published in the Journal of AOAC International. This identification test is done in accordance with the CGMPs, which require that each lot of a component undergo testing to confirm its identity before use in drug product manufacturing (21 CFR 211.84(d)(1) requires that “at least one test shall be conducted to verify the identity of each component of a drug product. Specific identity tests, if they exist, shall be used”). A specific identity test for glycerin is found in the United States Pharmacopeia (USP) monograph. and Test B using gas chromatography that references the “Limit of Diethylene Glycol and Related Compounds.” The infrared absorption test identifies glycerin and DEG, but does not distinguish between the two. Test B distinguishes glycerin from DEG While the USP method is effective, there may be a potential for variability in the composition of products labeled as glycerin. Therefore, method modifications may be needed to the preparation of the Resolution, Standard, and Sample solutions and to the Chromatographic system to achieve suitable performance. Method modifications in analyses performed by FDA have included preparation of all solutions in methanol with appropriate modifications to the chromatographic system, as needed, such as temperature ramps and hold times. of the component and any subsequent distributor(s)). 3. All manufacturers take every opportunity to ensure proper testing of glycerin for DEG contamination. All personnel in pharmaceutical manufacturing facilities (especially personnel directly responsible for receipt, testing, and release of glycerin) should be made aware of the importance of proper testing and the potential hazards if the testing is not done. 4. Repackers, and others who distribute and prepare glycerin for use in drug products, test glycerin that is used, sold for use, or intended for use in drug products. 5. Pharmacies that use glycerin in compounding drug products either test the glycerin for DEG content or ensure that such testing was properly done by a reliable supplier. Bulk or repackaged glycerin intended as an excipient or other component of a drug product is a drug as defined by section 201(g)(1) the Act (21 U.S.C. 321(g)(1)). Section 501(a)(2)(B) of the Act (21 U.S.C. 351(a)(2)(B)) requires that the methods used in, or the facilities or controls used for a drug’s manufacture, processing, packing, or holding conform to CGMP. Testing bulk or repackaged glycerin for DEG content is consistent with good manufacturing practice required under the Act. with DEG, precautions should also be taken to identify reliable suppliers and secure shipment to prevent similar occurrences. Understanding chemical structure will help you to understand the toxicity .